She is a Spanish Medical Doctor, graduated from the University of Valencia (Valencia, Spain) in 1978, and specialized on Hematology and Oncology at the Hospital Clínico Universitario de Valencia. In 1985, she obtained her PhD degree from Universidad de Valencia. At the moment, she is a Medicine Professor at the Faculty of Medicine at the Universidad de Valencia, and Head of the Hematology and Medical Oncology Department at the Hospital Clínico Universitario de Valencia. 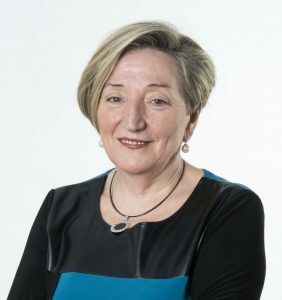 She is Principal Investigator at the Biology Research in Breast Cancer group, at INCLIVA , and she has worked in several national and international research centers. Her research on oncology, and in particular, on breast cancer, have placed her as a leader in the field, nationally and internationally. Dr. Lluch main lines of research include an important contribution to identify and test tumoral biomarkers for cancer prognosis, and for therapeutic responses prediction in breast cancer. She is a member of the Spanish Medical Oncology Society, the European Society for Medical Oncology and the American Society of Clinical Oncology, vice president of the Spanish Society of Senology, and member of the Foundation for Mastological Studies. She has advised several regional oncologic programs. She is also a member of the ECO Foundation and of the Clinical Research of Breast Cancer Unit at the Spanish National Center of Oncologic Research. Since 2014 she is an academician of the Royal Academy of Medicine and Science of the Comunitad Valenciana.